Crispy Chicken is really very crispy.In this am using a microwave to prepare this Crispy Chicken.It very easy to prepare with less time.you don’t have to take much efforts for preparing this.I give you a simple recipe to prepare this.Hope you all like it. Prick chicken with a fork of all over. Mix marinade ingredients and add chicken. keep covered for 4 hours or overnight in the fridge. Cover with a plastic wrap and microwave it for 4 minutes. Beat egg lightly with salt and red chilli powder. 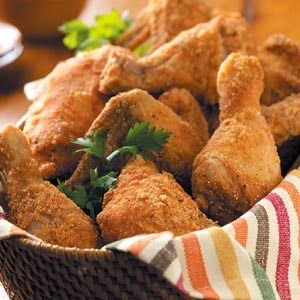 Dip each chicken leg in egg and roll it in a bread crumbs. Placed chicken on non-stick tawa and placed the tawa on low rack. Pour 1 tbsp of oil or melted butter on the pieces and grill for 8 minutes. Turn pieces and brush 1 tbsp oil or melted butter. Grill it for 4 minutes or till the chicken turns golden. To make a dry crumbs, tear 4 bread slices into small pieces. Spread on a plate and microwave it for 2 minutes. Mix lightly and microwave for 1 minute. Cool for 10 minutes to make crisp. Grand in a mixer to get crumbs.